Productive apps are those which helps you to concentrate on your work more than concentrating on unproductive activities. Now, what is an unproductive activity? Unproductive activity is those which consumes your precious time and divert your mind from your work. We can take social media as the best example. Being engaged in social media sites can be quite helpful to increase your knowledge and also helps you to explore interesting things across the globe. Here I mentioned social media as an example because most the social media users are wasting a lot of time using it and as a result, they are getting diverted from doing most important work. For example for the people who work at home, the Social media can be dangerous. Once you open your Facebook or Twitter account, you will keep scrolling endlessly before you realise that you have wasted your day for nothing. So, how to stop wasting your time on Social Media? Well, if you are addictive social media and want to control it, then here are the best productivity apps to for 2017. Since there are bundles of productive apps and programs available which will help you to improves your concentration on your work, save your time, make a task easier for you and will make it quite interesting. As you will be knowing that there are a number of productive apps available but most of them are fake or simply they are created to waste your time. So here are the list of best 20 Productive apps to increase your productivity. 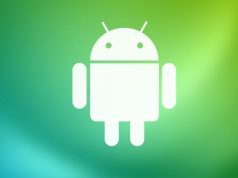 Do note that, the list consist of apps for Android and iOS devices and also for your Windows OS running PCs. Forest app is one of the best productivity apps to keep your focus intact. The app was mainly created in order to reduce your addiction towards your phone. Basically, in this app you plant a seed in the forest and within a particular time, that seed will grow into a tree. Now take for example you planted a seed and within 25 minutes that seed will grow into a tree before that seed grows into a tree, you have to set a goal to complete any of your personal tasks. You can also set time duration of your choice. Thus this app will keep you motivated doing your task more efficiently and will also reduce your addiction towards your phone. Basically, Pomodoro is an app similar to Forest app. Here the only difference is that you don’t plant a seed or anything like that, you just set a duration in order to complete a task and you have to complete it before the time ends. This app is light and will not consume too much of storage space. Thus this productivity app will help you to involve in more productive task rather wasting your time on unproductive activities. What is Slack? 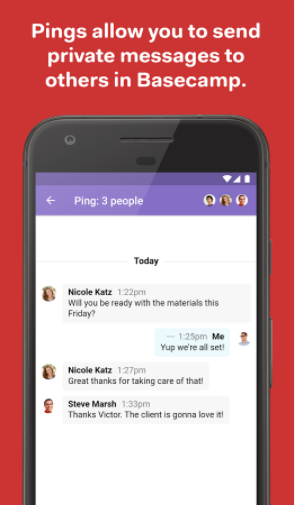 Slack is an Android app which helps you bring team communication and collaboration all at one place. You may find it difficult to find a specific email when your e-mail account is too messy. Slack comes to your rescue here. Slack prepares a list where all the conversation, documents exchanged, files sent or received are recorded in a very systematic order that whenever you are in need of a mail or any documents you may find it without any difficulty. Slack is like your personal assistant. It also manages and customises your notification, so that you can focus on your task more. 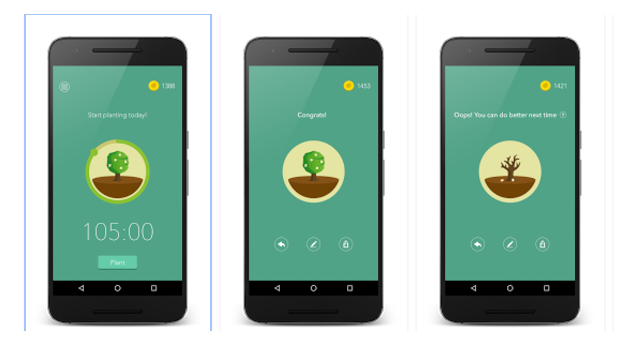 This productivity app may make your task easier and may also save you a lot of time. Because “Time is Money“! If you are surfing the internet and you find an interesting article but have no time to read it, Pocket is your mate here. Here the Pocket app works for you. Pocket app helps you to save articles, videos, page or any link all at one place and you can return to it whenever you need it. 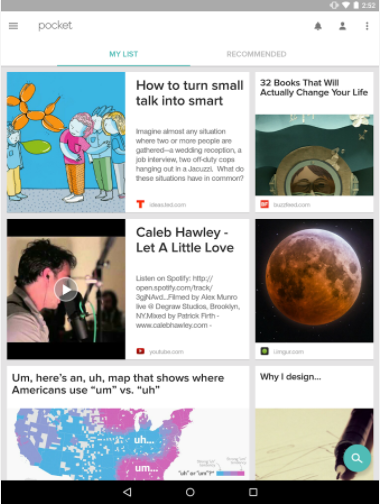 Pocket can save from any place, for example, Facebook, Twitter, Feedly, Flipboard and so on. Thus it may be worth downloading this app. The pocket app is available for MacOS, Windows OS, Android, iOS and for some other OS. So, irrespective of the devices you own, you can install this app. WriteRoom is an app available only for MacOS. This app creates a distraction free environment and manages all the notifications which may distract you while writing. So basically this app helps you to focus on your writing and doesn’t allow you to divert to do any other task. If you are a Windows user and want any similar app like this then you can go for Zen Writer. This app also performs similarly to WriteRoom. WriteRoom is the best productivity app for iPhone and iPad. Remember the Milk is a smart app for busy people. With its millions of worldwide loyal fans, Remember The Milk is one of the most famous productivity app currently available. 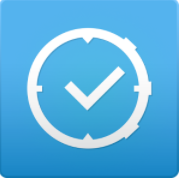 This app performs various tasks, remembers all your important task and keeps reminding you regularly. It creates a list of all tasks needs to be done by you and on what time it’s to be completed. It also helps you to find tasks nearby and also helps you to do it in the best way possible. 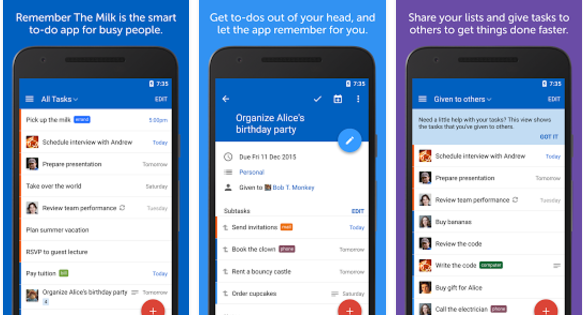 This app integrates with Gmail, Google Calendar, Twitter, Evernote and more. You can sync this to all of your devices. It also allows you to share your task with others to get things done faster. 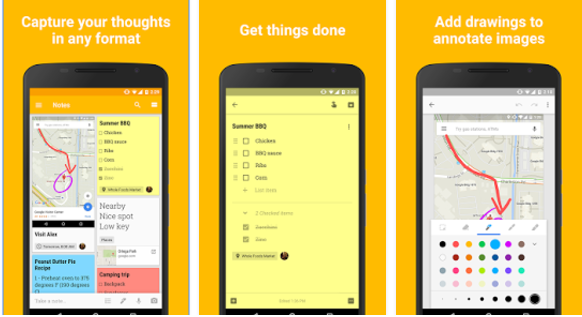 Google Keep is an official app from Google Inc. Using Google Keep app you can quickly capture the ideas which appear in your mind. 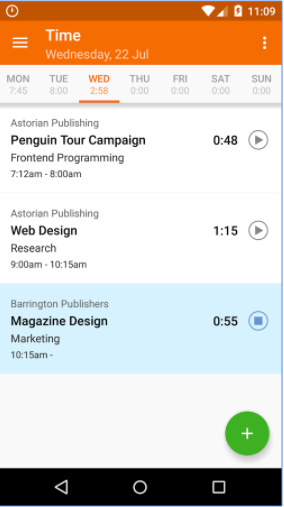 You can store a quick note in order to use it later, you can also store voice memos. This app is available for Android devices and for Computers too. All the saved stuff are stored online thus if you ever loose your saved things you can just log in and regain it online. In order to use this app you just need a Google account. 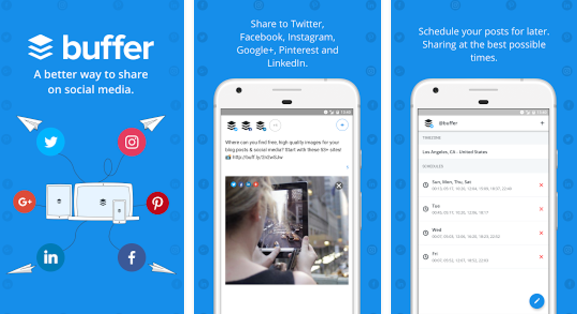 Buffer is an Android app used to share in social medias. If you want to share a photo or any other media on any of the social media you can just schedule the time and date and on that time your post will be shared. You can share on Twitter, Facebook, Google+, Instagram, LinkedIn and so on all at one place. You just need to upload the link/text/photos/videos in the buffer and select where it should be shared and schedule the time of your own choice, exactly on that time your post will be shared. Thus this app help you to save your time and concentrate on your other task. 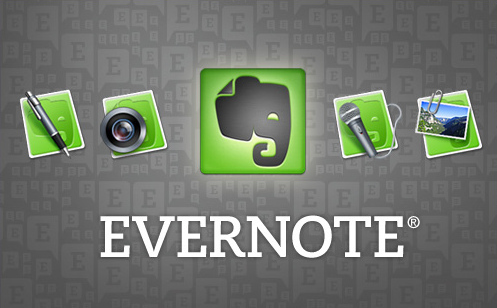 EverNote yet another useful and a very famous app. Evernote performs various functions such as organising your receipts, bills and invoices. It allows you to scan business cards, printed documents, handwriting and sketches. you can attach Microsoft office docs, PDFs and photos, write down the important notes, capture ideas and the list goes on. You can sync Evernote on your computer, phone and tablet. You can start a task on a device and resume it on another device using Evernote without any difficulties. 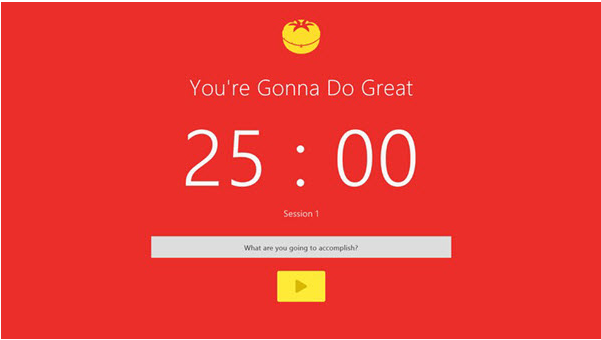 2 Minute is an app/site which helps you to relax and concentrate more on your work. This app is mainly for people who work on a computer or with a stressful job. You just need to go to this site and you can listen to the free music of waves and do nothing for 2 minutes. If you slightly move your mouse, it will reset and ask you to try again. Repeating this process several times a day maximises the positive effect. Since we all have different accounts for different uses and different passwords too. So it’s quite difficult to remember all the passwords and in case if you forgot any of those passwords you have to again go through all those verification steps in order to create a new one. So here is an app called 1Password which will manage and remember your all password for all your different accounts. 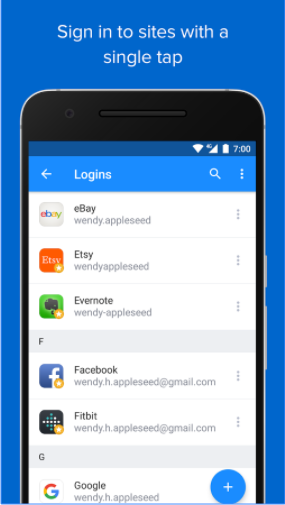 !Password1 is the password manager that you need and also you deserve! You just need to store your password with the respective account in this app and this app will organise it in a systematic way. It also allows you to log in to your different accounts through its app with just a single tap. For good productivity, you need to have a good sleep. Nothing is more important than a good night sleep, and if you wake up in a good shape, you can make most out of your day. This site personalises your sleep cycle and tells you at want time you need to sleep, what time to wake up and how much hours of sleep you need. 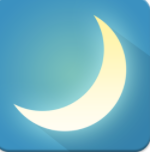 So this site may help you to improve your sleep cycle and thus you can wake up in a fresh mood. Ads can cause web pages to load slower, may consume your battery and will also consume your data. Ads can divert your mind from your real task also wastes your lot of time. Ad Blocker Plus is one of the most famous ad blocking site/app and has gained very much importance in the past few years. 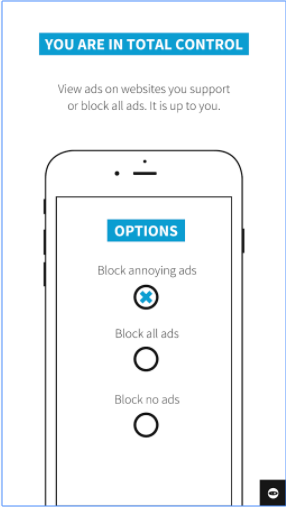 This site blocks all the ads, saves your battery and data and also saves your time. It also helps to reduce the risk of malware infection and also enhance your privacy. 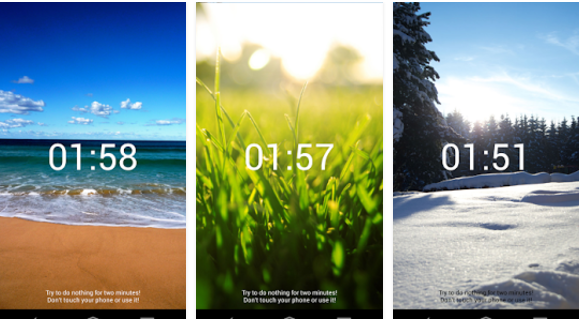 Time Tracker is an extension which tracks your time. Tracks your time in the sense, it keeps all the records of your time spent on doing each of the online activity. It gives you a detailed information about, your time spent on each website and apps. It also assists you to optimise your time and do more out of it. Thus it may help you to increase your productivity. Timestats is also an extension which is similar to the Time Tracker and does the same job for you. But Timestats is quite interesting when compared to Time Tracker. 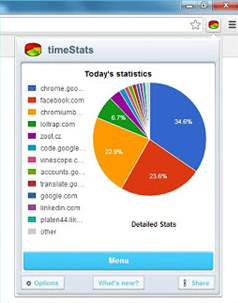 It shows you the time spent on each activity with the help of a piechart. In this, the information is much clear and also more accurate. BaseCamp is an Android app which allows you to do list, real time chat and also allows you to store docs and files. This app organises a schedule which keeps track of your major milestones, upcoming events and also the deadlines. 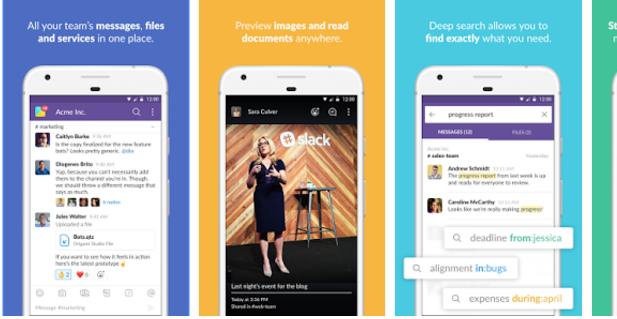 BaseCamp is a competitor for the app Slack. It does the same job as the slack do. But Slack is fully free to use, whereas you cannot use BaseCamp without the paid monthly subscription. Though the name of this app is Instapaper, it has nothing to do with the Instagram. 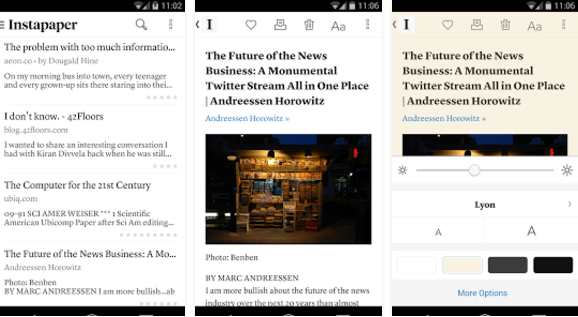 Instapaper is a site/app which allows you to save articles offline and you can read it whenever you want. It is similar to Pocket app. It is really simple to use and also save your time. It organises the list of saved article in a systematic way that you may find the required article easily. The app version also comes with an inbuilt browser to preview links without leaving the app. It also creates a distraction environment which helps you to concentrate more on the content. Momentum App is a browser extension which can be quite helpful for you. Whenever you open the browser the app asks you that what is your today’s main focus. After that whenever you open a new tab this app will pop up alerting you to focus on your task. Thus this app will help you to stay focused on your main task and also doesn’t allow your mind to get diverted to do any other unproductive activity. Site Block is an app which blocks all the websites which may eat up your time. If you think deeply, you will realise that a huge amount of your time is being wasted in doing these unproductive activities. If you enter open Youtube to watch a video you will end up watching 10. Thus here a lot of time is wasted and you are left gaining nothing. So basically this app block all those sites which may waste your time and motivates you to do more productive tasks. Harvest app is an app where you set a timer in order to perform a particular task, and the end of the day you can just check whether the time exceeded to perform that task and you can just adjust the duration by your own choice. This app allows you to edit current/previous time entries and track time online or offline. This app requires a free or paid Harvest account. So this were the best 20 productive apps currently available and which may help you in different ways. Since it’s not guaranteed that it will produce the given result as explained, but it does work and that’s for sure. These productivity apps could be really very useful to some people and may not work for some other people. Do let us know your favourite app in the comments.